As the latest DOR reminded us, it’s been decades since the passage of the Civil Liberties Act of 1988, that granted redress and a public apology to those in camp. Since that time there’s fortunately been a truckload of information that has come out about that once not-talked-about period in our collective history. Looking back at the last 20-odd years, it’s easy to see how the passage of the redress bill and the commission hearings served as a turning point for JA camp survivors as they went from victims to heroes. Once hidden in the closet, camp memories came thundering out. With the Constitution at stake and the lives of other minority groups who could be similarly victimized, the JA experience has served as an important paradigm. However, in spite of all the research, books, films and oral histories, not to mention institutions and community organizations wanting to preserve our past, there are still parts left deeply buried. To cite one example: there are many stories still hidden at Tule Lake. Back in 1994 I attended my first Tule Lake Pilgrimage. Being one of those eager postwar Sansei just beginning to taste the dust of camp, I figured what better way to do that than spend four days with 275 other Nikkei on buses and in cramped living quarters at the lake bottom around Castle Rock. The experience turned out to be all that it was cracked up to be: difficult, enlightening, cathartic, and sometimes even fun. I came back from that weekend with a deep sense of community and a greater understanding of the many who still feel ashamed to admit they’re from Tule Lake. Two simple questions separated the loyals from the so-called disloyals, the good guys from the troublemakers, American citizens from renunciants. While sitting in the small group discussions that year, I realized that there are those who feel the sting of choosing not to declare their allegiance or fight for the country that took their rights away, especially since Tule was further denounced as the camp where widespread civil disobedience took place. 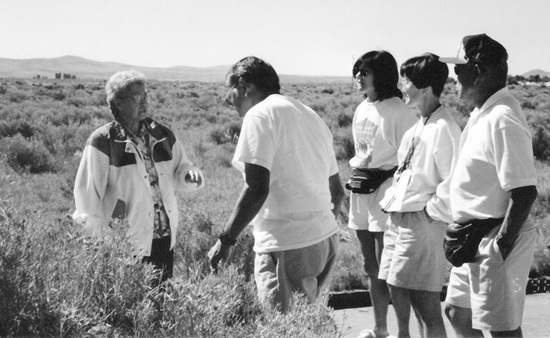 Capturing memories of Tule Lake from Mrs. Ikemoto at the 1996 Tule Lake Pilgrimage. That was more than 15 years ago, and thankfully today we are learning more about what went on at Tule Lake due to inquisitive scholars and dedicated supporters, none more passionate than the stalwart group of volunteers who plan the pilgrimage every other year. Among them is Hiroshi Shimizu, who also attended his first pilgrimage with me in 1994 but has since become one of its most committed voices. In talking to Hiroshi a few weeks ago, he casually mentioned that he had just returned from the National Archives office in San Bruno. He and another Tule Lake ally had spent days going through and copying a huge cache of affidavits from the files of Wayne Collins, the civil rights attorney who singlehandedly fought to restore citizenship for thousands of renunciants from the close of the war to well into the 1970s. The affidavits were first-hand testimonies in the form of governmental petitions sought by Collins to help in the legal battle he fought for those who felt compelled to renounce. Collins accomplished the painstaking job of representing thousands of renunciants by applying for individual repatriation one by one, case by case. Hiroshi sent copies of a handpicked few of those affidavits, and the voices that spoke through them were spellbinding. Here were detailed self-written histories that provided an in-depth look at why these men chose to renounce. Several of them talked of their abiding fear that all so-called “enemy aliens” would be sent back to Japan, and their terror of how they would be treated there. After reading just a sampling of their stories, I’m even more intrigued by the topic that is the theme of this year’s 2012 pilgrimage, “Understanding No-No and Renunciation.” Being held June 30 to July 3 (the weekend before July 4 this year), the pilgrimage is sure to sell out, I’m told. I’m looking for some fellow curious and intrepid travelers willing to invest a little time with a huge return — discovering more about what really went on at Tule Lake. For registration forms and information about the 2012 Tule Lake Pilgrimage, visit www.tulelake.org. If you would like registration forms mailed to you via USPS, or if you want more information, contact Hiroshi Shimizu, (415) 566-2279 (tel) (415) 317-2686 (cell) or [email protected] Going to the pilgrimage irrevocably touched my life; it’s not too late to change yours. 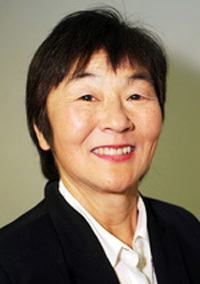 Sharon Yamato writes from Playa del Rey and can be reached at [email protected] expressed in this column are not necessarily those of The Rafu Shimpo. Sharon: To discuss Tule Lake concentration camp without once mentioning the JACL is like talking about the Holocaust and not mentioning Nazis or their collaborators. Be clear on the difference between a renunciant and someone who answered “No-No” on the loyal questionnaire. Although the government must bear the brunt of the blame for this injustice, JACL members should hang their heads in shame for being associated with one of history’s most deservedly reviled organizations that should have done the right thing and disbanded after the war. Very good and informative article Sharon, it has inspired me to attend the next Tule Lake pilgrimmage to learn about the hardships and “resentment” of the “No No” people during a difficult chapter for the Japanese community – both citizens and non-citizens.